The solid materials industry is well aware: Stretch Hood is the answer to their needs for greater protection for their palletized goods and greater automation at their end of line. 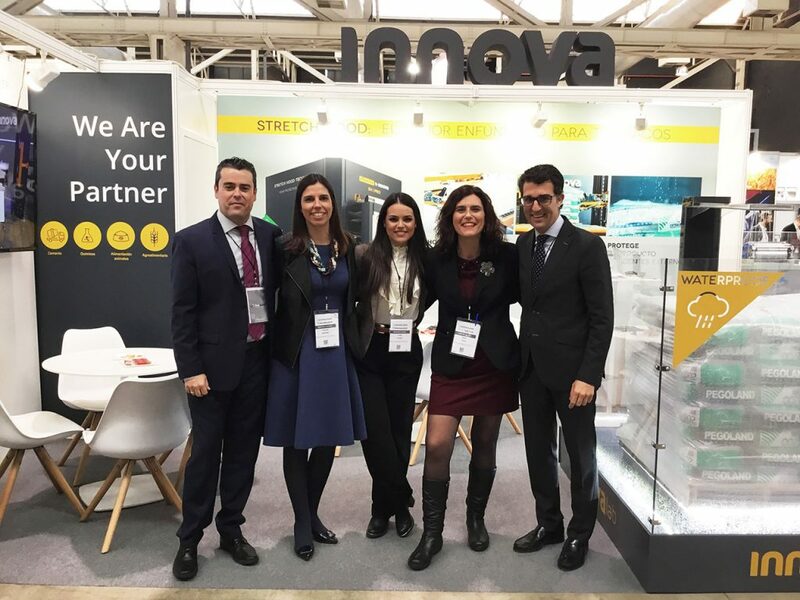 This was one of the great conclusions that INNOVA gathered after the fair Exposolidos 2019, held from 12 to 14 February in Barcelona and specialized in the processing and transport of solids. At the event, Innova demonstrated the advantages and applications of Stretch Hood protection for bagged and palletized products, and how this system offers the best final packaging solution to many companies. The visitors at the fair confirmed that the solids sector, in particular the chemical, agrochemical and cement sectors, require greater protection for their final product. Therefore, the Stretch Hood system proposed by Innova was acclaimed as an advanced solution to their problems of production and automation for their end-of-line. Compared to other final packaging systems, such as the automatic or semi-automatic wrapping machine, Stretch Hood represents a considerable saving of plastic for the final protection. With the apllication of one cover, Stretch Hood protects the palletized product by its 5 sides without the need of applying a cover. According to analyses carried out by Innova, Stretch Hood allows savings of up to 50% in film consumables compared to other systems. Due to the packaging technique and the properties of the Stretch Hood film, it also provides a waterproof protection against rain or humidity and other external factors (dust, UV rays, etc.). 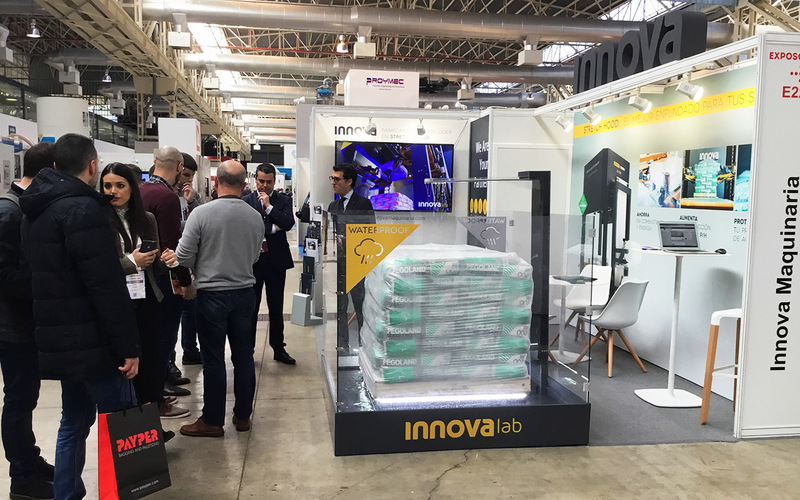 As a novelty for Exposolidos 2019, Innova exhibited one of INNOVALab’s tests with its Waterproof pallet fountain. 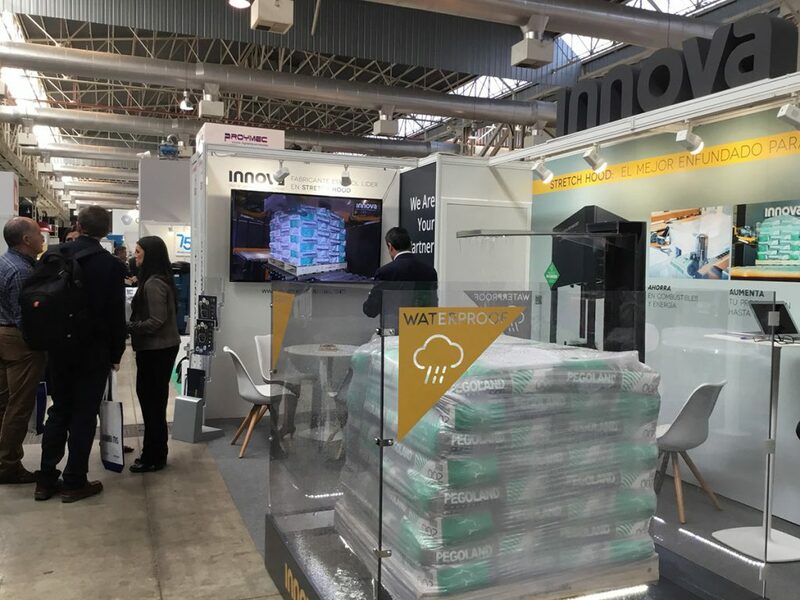 For this purpose, Innova exhibited a cement pallet, courtesy of their client Grupo Puma, which was subjected to a continuous rain during the 3 days of the fair. Thousands of visitors to the fair could experience first hand the protection of Stretch Hood against the rain. Innova’s Waterproof Fountain is one of the tests carried out at INNOVALab for each customer. Its objective is to check that the Stretch Hood film adapts completely to the product, leaving the load completely sealed and watertight. Compared to other similar systems, such as automatic or semi-automatic wrapping, Stretch Hood offers superior protection and packaging quality, as it was acclaimed by the visitors to the fair. The total automation of the end-of-line was also one of the main concerns of the companies visiting Exposolidos. The chemical and solids industry is already implementing ends of production more automated and connected according to Industry 4.0 standards. In this sense, Innova proposed at the fair advanced packaging solutions that allow automation and connectivity, such as the Stretch Hood line. The Stretch Hood system has been designed to replace semi-automatic systems, enabling a faster production by packaging up to 150 pallets/hour. In addition, Innova carries out a packaging project in which they develope and manufacture a complete line with conveyors, strapping, labelling and other industrial robotics solutions. Innova’s Packaging Line adapts to the needs and systems of each customer in the production plant. Several companies of solid materials such as cement, chemical products, food and agriculture, among others, already have Innova’s Packaging Lines, thus managing to optimize and automate both their production and the protection of their products. Thanks to visitors, customers, partners and collaborators for visiting us at the fair! See you in the next edition of Exposolidos!